Hey quilters, I may actually have time to do a podcast this coming weekend – yeah I know, it took me 9 days just to type up 2 blog posts, and now I am going to want to get a podcast done on top of it! In one weekend? We’ll see. Speed. Quilting speed. I am not necessarily interested in how fast you complete projects, although that is a good angle too, and will be included in the podcast. But more I want to know how fast you actually quilt. Do you think about your quilting speed, your piecing speed? How fast do you quilt? Does it depend on the project or project type? Do you zip through borders like mad? Does it hurt or help you in the long run? What about free motion quilting? The speed is one of the hardest things to get used to on free motion quilting, so are there any speed stories out there? 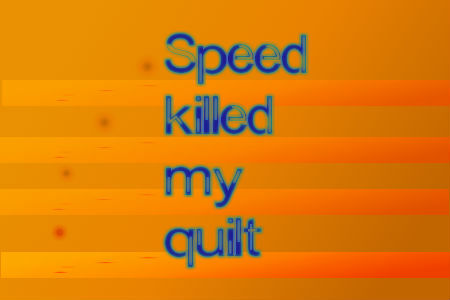 Or even more fun (because we can learn from them) – “speed killed my quilt” stories. Or do you have tips and tricks about speed and quilting? I’m interested in what you find out about this! The way I usually work is that I gather up all the fabric I plan to use and put it in a pretty stack and sit with it for a little while (not literally, but I mull over my choices for a bit to be sure that I like the colorway I’ve chosen). Next I do all the cutting. I make myself do it all at one sitting, or at least all in one day. If I stop in the middle, I might not ever get back to it, and it is hard to figure out where I left off. Hopefully right away, but usually on another evening or afternoon, I do all the block piecing. I usually make up one or two samples just to be sure I know what I am doing with the block assembly. Then I assembly line sew them up. I like to do all the blocks in one or two days, but it depends on how complicated they are. After this, I let the blocks lay around on the table for awhile. My quilting involves lots of resting… When I am ready and the living room floor is all picked up, I arrange the blocks on the floor (I don’t have a design wall) and then sew up the rows. Again, with this step, I don’t like to stop in the middle because we need to use the living room floor, and I can get confused about my arrangement of the blocks if I don’t sew it all up right away. Borders go on in another session. It can take me up to two years or more to finally send the project out for quilting. I hate the quilting step and I avoid it as much as possible. We often use the quilts on our sofa or I hang them without bindings for awhile until the mood strikes and I get the binding on. Binding doesn’t take too long, maybe an evening.. I definitely have a mixture of fast and slow quilting. My two current quilting projects are definitely sloooooow (my ‘genome quilt’ and a hand pieced hexagon quilt) and i’m thoroughly enjoying taking my time with it. I’m really enjoying each step with my genome quilt, taking my time and making sure it’s right – the cutting alone took a few full days! However, i’ve also done some quilts (baby ones) very fast (in a few evenings or so), and anything done at my grans house is usually fast as I always have a time limit of how long i’m staying, and i’ve enjoyed those projects too. Thankfully for me, maybe sadly for you, I don’t have any ‘speed killed my quilt’ stories… although I do have a quilt that I was very anxious to get basted (as it was my first ‘proper’ quilt) and I skipped out on finishing all the embroidery that I had planned and didn’t baste it properly. The funny thing is that I still haven’t finished the quilting on it, so speeding into the basting was pointless. I’m still trying to decide whether to unpick the quilting and re-do it properly. I answered your question on Bigtent, but talked about the speed I finish a project. I have to say that I sew at a pretty even, medium speed. Not a racer – if I go to fast, my machine starts bouncing around on the table! Same for free motion – when I learned, my teacher said to put the pedal to the metal, but since then, I’ve found that medium speed, with lots of stops works best. Like Susie, I have to stop and contemplate things every now and then. Especially the quilting – I’ll often leave a top for months while I ponder / get up the nerve to quilt it. Okay, let me do this teacher style since I used to be one. 1.Do you think about your quilting speed, your piecing speed? I think about speed when I’m working on a machine. I have actually come to realize that if I want blocks that match better and look better, I should hand piece them. And since I find machine quilting stressful, I prefer hand quilting. As you may imagine, things don’t get done very quickly at my house. 2. How fast do you quilt? Does it depend on the project or project type? Do you zip through borders like mad? Does it hurt or help you in the long run? I don’t quilt very quickly at all. See above. 3. What about free motion quilting? The speed is one of the hardest things to get used to on free motion quilting, so are there any speed stories out there? I have not actually ever tried free motion quilting yet. I’m planning to try in the near future with some table runners I’m going to make from some of the blocks I’m making for my blog. So my answer can’t really be useful. Sorry, Darla! I listened to your podcast about calculating how fast you piece. For me, speed is important, but accuracy is more important. If I piece too quickly, I don’t save any time at all because then I have to rip out the spots that are sloppy. I’d rather go slowly than have to resew. But then I started to wonder: how fast can my sewing machine actually stitch? If I were really into speed, I would calculate that by sewing several long pieces (not sewing them to anything else, just sewing as fast as I could). Then if I calculated how fast I could piece (by using your experiment), I would be able to find out how close I am coming to the maximum piecing speed possible on my machine. I’d like to know if having a very fast, high powered sewing machine is worth the cost. If I’m only using, say 65% of its possible speed, maybe it would be more economical to buy a cheap, slower machine. However, if my piecing speed is approaching the maximum speed of the sewing machine, maybe I should buy a more powerful, faster sewing machine,(assuming my piecing will get faster over time). If I could find our stopwatch, I’d test some of this stuff!